ColorProof utilizes a unique product development process that allows it to deliver best in class products, with the highest quality and newest ingredient technology for maximum color protection and hair that’s shiny, beautiful, vibrant, healthy and instantly youthful-looking. The process starts by determining the desired performance and then selecting the very finest ingredients to deliver that performance, not limited by price. This is very different than most manufacturers who conceive a product in terms of its price point first, which limits the quality of ingredients that can be used. Products are not released until they are proven to exceed the performance of any other product in their category. We are obsessed with excellence. We use only the finest, next generation, super luxury ingredients to deliver superior product performance that dramatically improves hair condition while maximizing color retention. ADVANCED COLORLAST SYSTEMTM FEATURING CHROMAVEIL® & HELIOGENOL® Breakthrough ingredients that together provide powerful full spectrum UVA/UVB color protection. PROPRIETARY SULFATE-FREE/SALT-FREE BLEND OF 7 SURFACTANTS Not all sulfate-free shampoos are created equal. ColorProof shampoos rise above utilizing an exclusive blend of the newest, super premium surfactants to deliver the most gentle cleansing possible with an explosively billowy lather that rinses clean and provides 96% color retention. 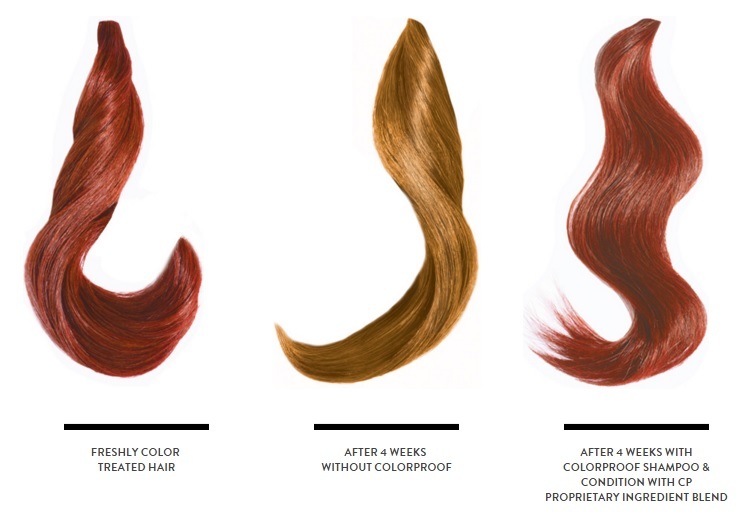 *The result is clean, healthy hair with exceptional color vibrancy. NANO TECHNOLOGY Nano-sized particles (1/50,000 the size of a human hair) allow active ingredients to safely penetrate deeper into the hair shaft to strengthen, repair, add shine, increase color vibrancy and deliver maximum color and heat protection while dramatically improving hair condition like never before possible. ANTI-AGING INGREDIENTS A powerful blend of ingredients restore elasticity and tensile strength while adding exquisite shine, returning hair to its most youthful condition possible. NEW FLEXSHIELD TECHNOLOGY Revolutionary polymers shrink wrap hair for unsurpassed heat and color protection up to 450°. PROTEIN POWER COMPLEX Superior blend of proteins derived from potatoes and soybeans increase elasticity and tensile strength while repairing and restoring hair. CERTIFIED ORGANIC BOTANICALS Provide natural conditioning to balance, nourish, and protect. *Color retention after 10 washes using ColorProof Shampoo and Conditioner. Results may vary. Combing of the hair damages hair fibers, making them weaker and more prone to damage. 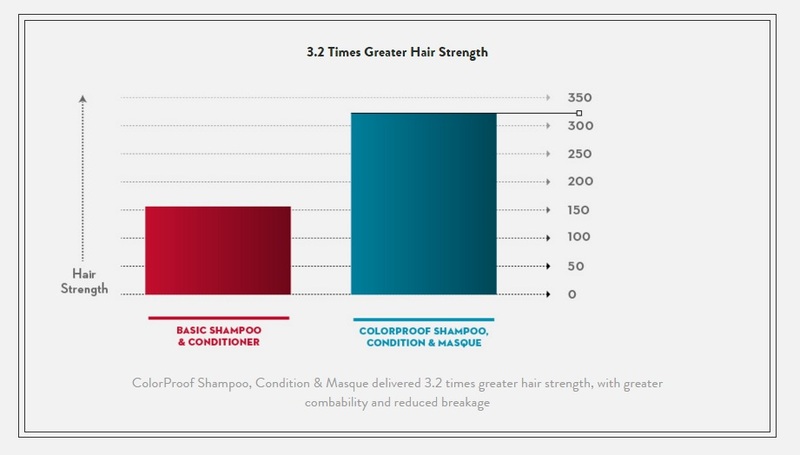 An independent research study proved that hair that was combed 10,000 times after using ColorProof Shampoo, Condition and Masque was 320% stronger and more resistant to breakage. 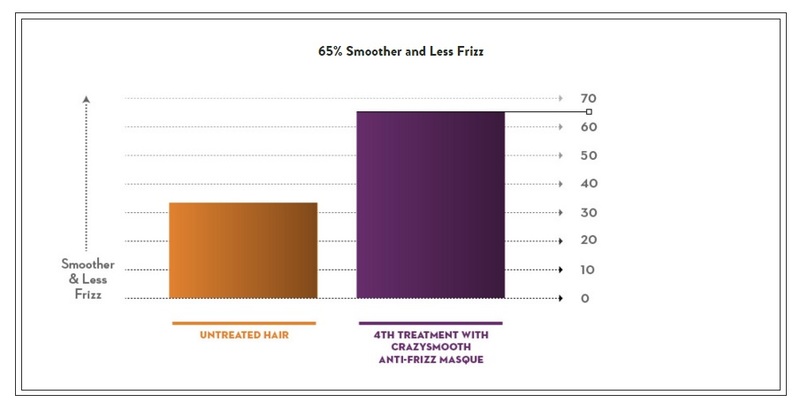 ColorProof proprietary CrazySmooth formulas deliver unparalleled smoothing and defrizzing even in the most humid conditions. An independent research study proved that ColorProof's proprietary formulas designed exclusively for naturally-curly color treated hair retained 84% of curl memory after combing 50 times.